Description: The princesses want to look absolutely perfect on the first day of school and a perfect look starts with perfect nails. The girls have decided to do their manicure together and they are expecting a nice nail art which you are going to create for them. They also want you to choose nice accessories for them such as rings and bracelets. 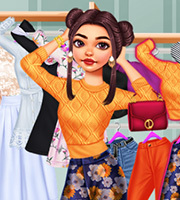 Once done, you can help the princesses pick nice and trendy outfits, hairstyles and jewelries. Have fun playing this dress uo game!